Whether you are a native to Philadelphia or just visiting, anyone can tell you about the murals that are painted all around the city. Murals can be seen on the sides of houses to giant story buildings, all displaying different images that act as a reflection of the city they’re home to. Could you imagine designing and creating a mural in a big city like Philly? 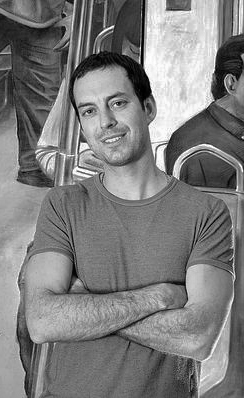 Jason Schell, an alumnus from Temple’s Tyler School of Art, has been given an opportunity to create his own mural for the Mexico City Transport System. After the success from a mural he did two years ago, the Mexico City Transport System, commissioned by CTS has asked him to create another one that captures the “stature of the metro system.” This 8-by-36-foot charcoal painting was set to be revealed on Sept. 4, but might be pushed back to late September or early October of this year. The Temple News: What is Mexico City Transport System? Jason Schell: It’s the fifth biggest in the world and by far the cheapest out of all the major metro systems in the world. It’s kinda like the one in New York City, but designed more like the one in Paris. I think it might [have] been designed by the same person. It runs on wheels, which provides a much smoother ride. Another interesting thing about it is they created an underground space where there’s places to buy food and shop. It’s like its own little world down there, and not every station is like that. TTN:How did you get the opportunity to be able to do this? JS: I had the opportunity to do a project two years earlier, and because of that piece they asked me to do another one. TTN: What inspired the mural? JS: The director of culture said go to the station, develop a concept and then bring it back to him. Basically they gave me freedom and control. I just went and observed the people and the culture of the city. TTN: How did your time at Temple contribute to the success you have today? JS: I think that Tyler is a good art school and I think it helped instill in me a good sense of work ethic, especially from the classes that I had to take. It helped me understand my work ethic as an artist and also my talents in life. Because art in a way is a lot different than a job. Its like a job without hours, you’re working all day. TTN: What are some of your future career goals? JS: I think that as an artist I want to keep relevant by doing more public art, because I feel like you can keep yourself in check more rather than in a gallery. I really like the gallery but I feel that sometimes you can get self-absorbed and public art gives you a chance to reach a much larger audience. TTN: What inspires you as an artist? Or do you have someone that inspires you? JS: One thing that really helped was when I was studying at Temple I got the chance to study abroad in Rome. I was taking a class in Rome where we had to fill stretch books with drawings from all around the city. Now that I think about it, the experience helped me grow as an artist and help recognize my true passion for public art. TTN: What are some challenges you faced with this project? JS: I would have to say democracy. When you’re an artist you apply yourself so hard and it’s difficult when other people aren’t doing their job. It’s not just me working down there, there are also engineers working as well, and sometimes it can be hard trying to all work together. There was also a big challenge with preparation. Even through I’m doing the project for the city, I still had to cover most of the expenses and I have to plan out how many materials that I’m going to need. There are a lot of factors as an artist that you have to predict ahead of time, and that can make your project a little bit more difficult. But it ended up going really well, and all the planning was worth it because it went really smooth. Alise Hammond can be reached at alise.hammond@temple.edu.